These are just as nice as Walls Magnums.They have milk chocolate and also the almond coated ones. Works out at just over 26p per lolly,and are just as big as Magnums. Forgot to say that they were reduced from £1.99. If they are like they used to be, I haven't shopped their for a while, then they are much better than Magnums! If they are like they used to be, I haven't shopped their for a while, … If they are like they used to be, I haven't shopped their for a while, then they are much better than Magnums! Yea they make good stuff, like these but LOVE the cones..much better than Cornetto who are stingy with both size and topping! 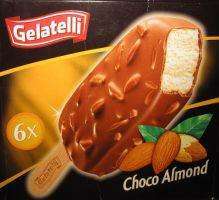 Enjoyed the almond-studded one for years. 100% recommended. Must try these then. I got the Thorntons ones yesterday as were on offer of 6 for £3 and they are rotten! Most epic-est ice cream EVA!! Do you have to eat the whole of the outer chocolate bit before you bite into the ice cream? Yum! Most definitely better than Magnum. I try to eat the icecream first then eat the choc on magnums. But that means you need a little plate whilst you eat. Definitely better than magnums! The almond ones are lovely and the white chocolate and strawberry ones (like Cadbury's Dream) are good too when they have them. Do you have to eat the whole of the outer chocolate bit before you bite … Do you have to eat the whole of the outer chocolate bit before you bite into the ice cream? Much better than magnum, no tash hairs. Nice one. We love Lidl for ice cream!!!! I use these during intimate sessions. They work well for this purpose and at a value price, I can't say no. I use these during intimate sessions. They work well for this purpose and … I use these during intimate sessions. They work well for this purpose and at a value price, I can't say no. All the positive comment's, must try these before I start my diet on Monday lol. These are scrummy, and as others have said much tastier then Magnums and a hell of a lot cheaper! Definitely better than magnums! The almond ones are lovely and the white … Definitely better than magnums! The almond ones are lovely and the white chocolate and strawberry ones (like Cadbury's Dream) are good too when they have them. Delicious,normally £2.79 in my local Lidl branch. Got some today I tell you what they are well nice! Is your Lidl next door to Harrods? Thanx to 'Uncle Potter' for the post ~ tried these excellent value for 6 ~ very tasty! As at Fri 20/4 they are STILL with the 20% off at £1.59 at my Lidl.